Creamer (Sunflower Oil, Corn Syrup Solids, Sodium Caseinate, Mono And Diglycerides, Dipotassium Phosphate, Tri-Calcium Phosphate, Soy Lecithin, Tocopherols), LESS THAN 2% OF: Natural And Artificial Flavor, Xanthan Gum, Salt, Carrageenan, Soy Lecithin, Acesulfame Potassium, and Sucralose. Mix 1 serving in 8-12 oz of water, milk, or any beverage of your choice. Vary the amount of water to achieve your preferred consistency and taste. For best results, take up to 2 servings a day. 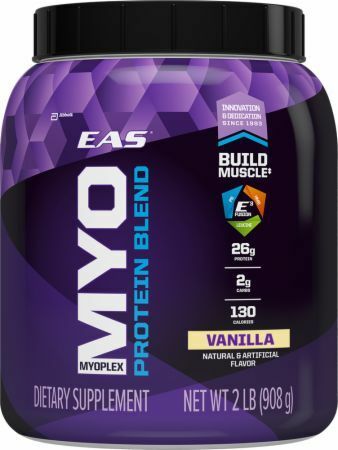 Whey Protein Isolate, Micellar Casein, Egg Albumen, Calcium HMB (Beta-Hydroxy-Beta-Methylbutyrate Monohydrate), L-Leucine, Phosphatidylserine, Creamer (Sunflower Oil, Corn Syrup Solids, Sodium Caseinate, Mono and Diglycerides, Dipotassium Phosphate, Tricalcium Phosphate, Soy Lecithin, Tocopherols), Natural & Artificial Flavor. Less than 2% of: Xanthan Gum, Salt, Carrageenan, Soy Lecithin, Acesulfame Potassium, and Sucralose. Creamer (Sunflower Oil, Corn Syrup Solids, Sodium Caseinate, Mono And Diglycerides, Dipotassium Phosphate, Tri-Calcium Phosphate, Soy Lecithin, Tocopherols), LESS THAN 2% OF: Natural And Artificial Flavor, Xanthan Gum, Salt, Carrageenan, Soy Lecithin, Acesulfame Potassium, Sucralose, and FD&C Yellow #6. The average person sees the physique, but doesn't understand it's your discipline that makes you different. That's why Myoplex is for the truly committed. Even the best ingredients are nothing if the same dedication doesn't go into the workout. A little better is never your goal—it can't be ours. So we've adapted. Expanded. Honed. We're putting all of our research and expertise into the ingredients that help you outperform. Before, during, even while you're asleep. And because you're never done, neither are we. This is you. This is us. And the proof? A body transformed.